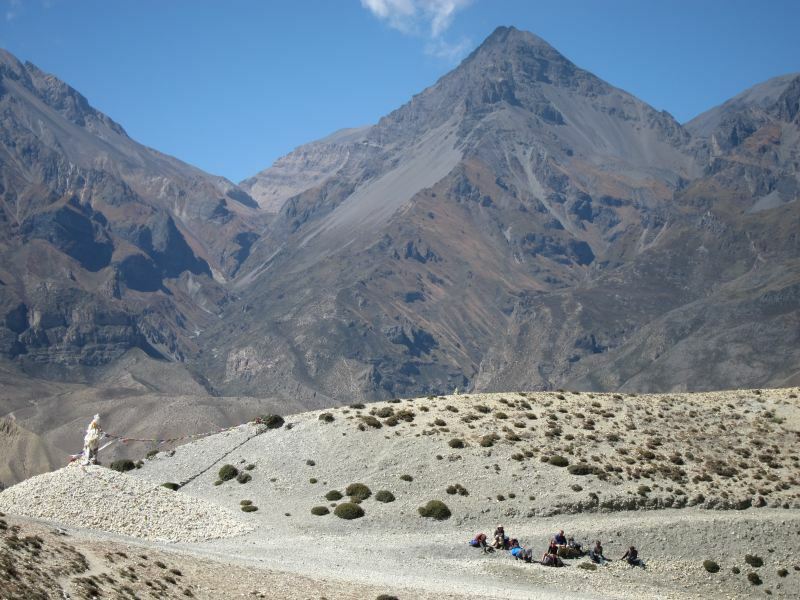 Some of the world's best walking, in extraordinary desert landscape north of the Annapurnas. 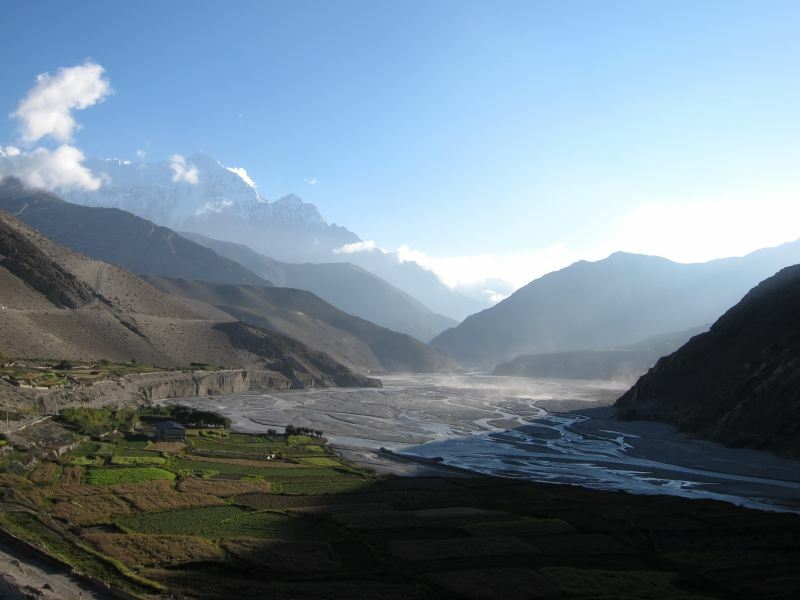 Crazily eroded ridges and canyons fall to the great central Kali Gandaki gorge. 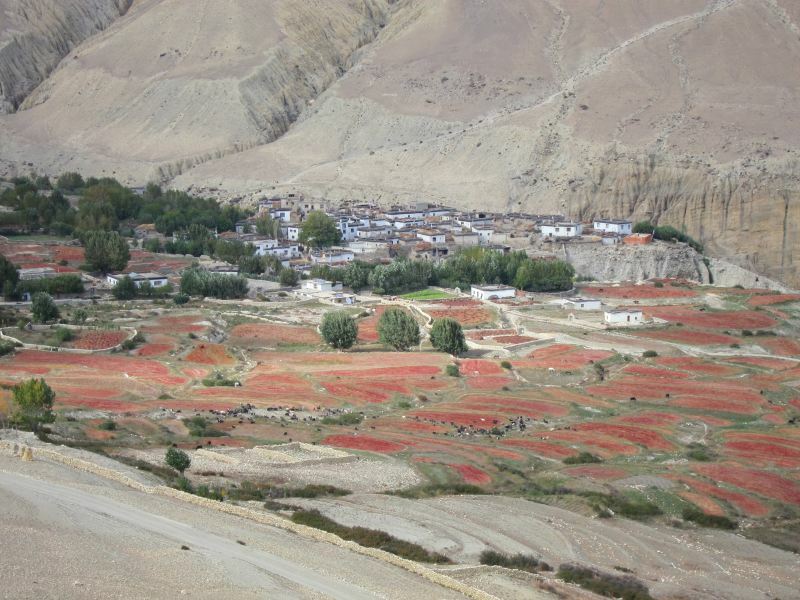 Intact Tibetan culture, fascinating villages nestled in their irrigated valley-bottom terracing; monasteries, mani walls, prayer flags galore. 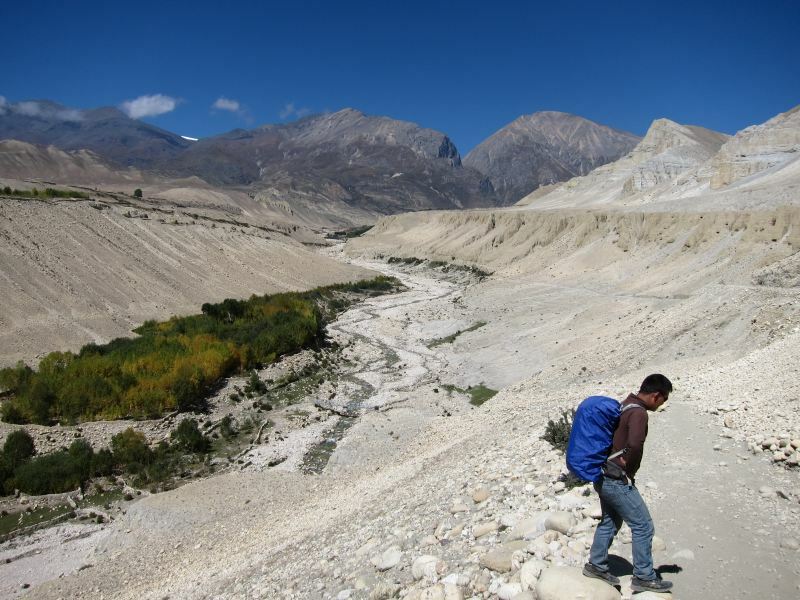 These are tough walks in high, remote mountains, where altitude can cause real problems. Come prepared. 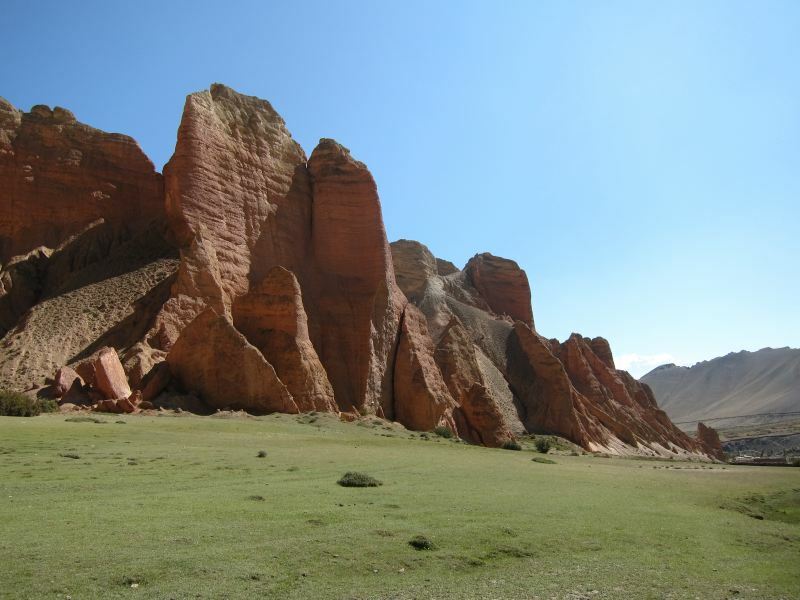 Mustang, the ancient Kingdom of Lo, is physically as well as culturally Tibetan: a high, windy, deeply eroded semi-desert, separated from the great plateau by bare, snow-capped mountains. 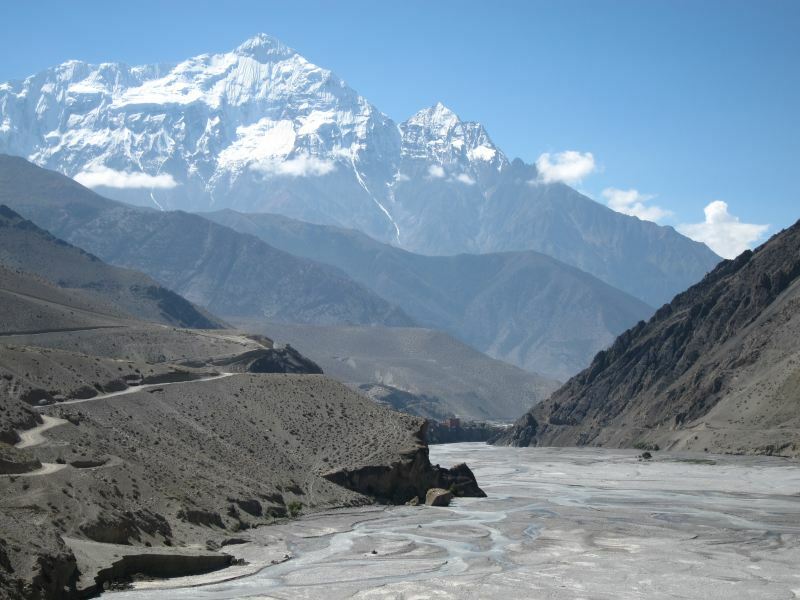 It lurks in the northern rainshadow of the 8,000m-plus Annapurna and Dhaulagiri massifs, inaccessible from the lowlands and thus culturally unadultered for centuries. 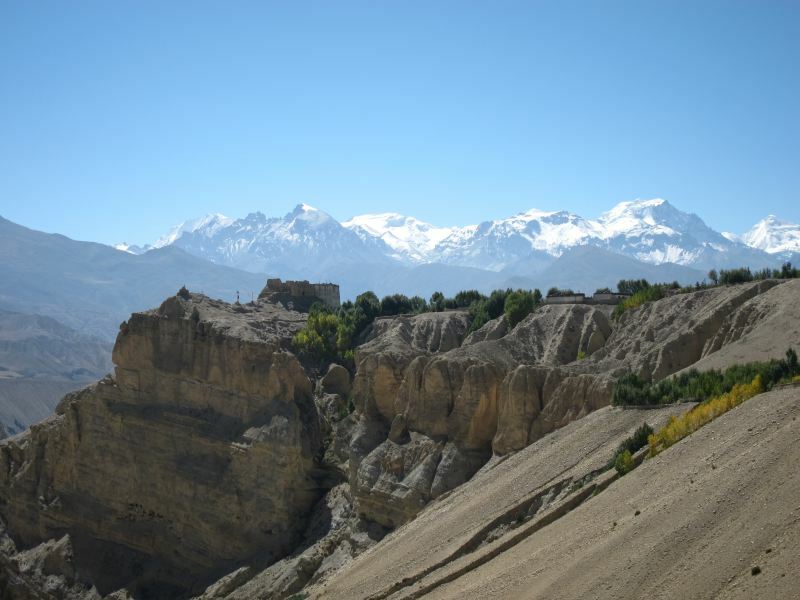 Mustang (Upper Mustang, technically) is a huge basin, surrounded by 6,000m-plus mountains and drained by the vast Kali Gandaki gorge - although this is often well disguised by its wildly broken ridges and side canyons. 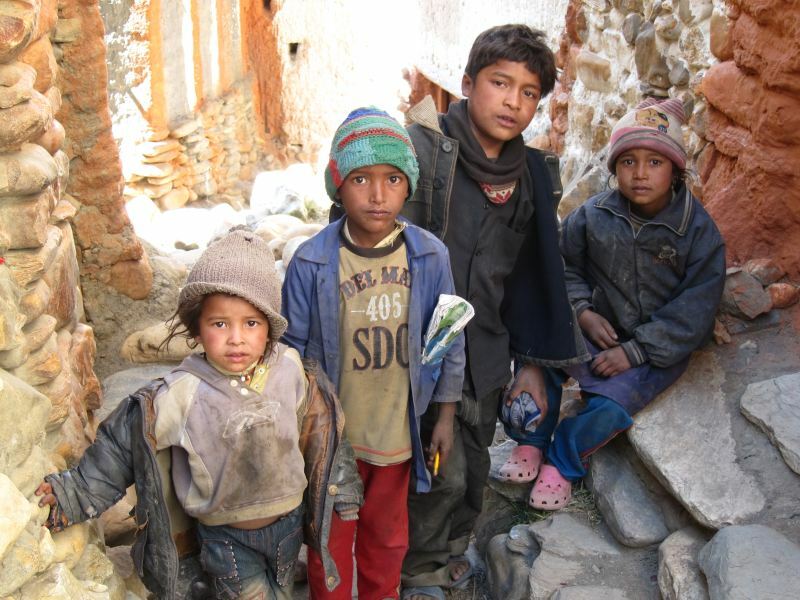 Like other areas north of the central Himalayan peaks, it is drier and tougher country than most of Nepal, often sparse scrub and bare rock, with towns and hamlets huddled in terracing and trees by the rare water sources. 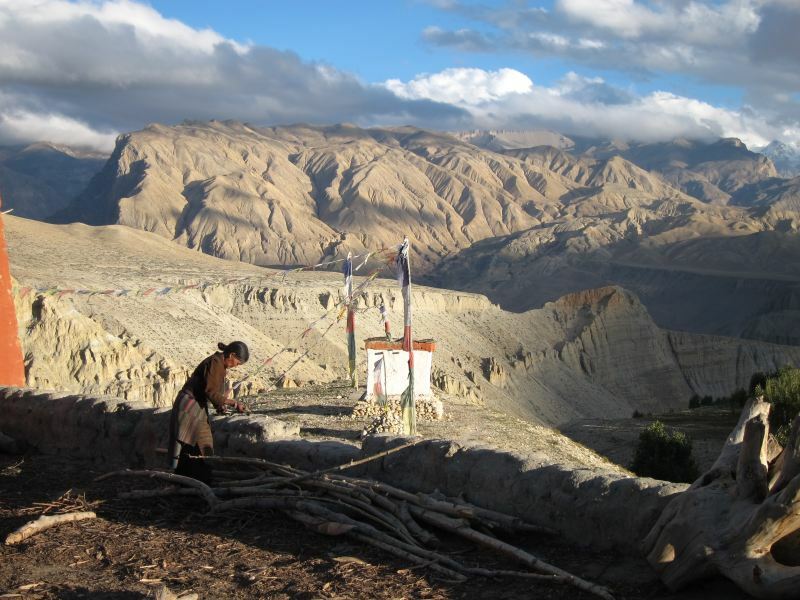 It is thinly populated as a result - this huge area is estimated to support 5,000 upward (around 7-8,000 is probably right). 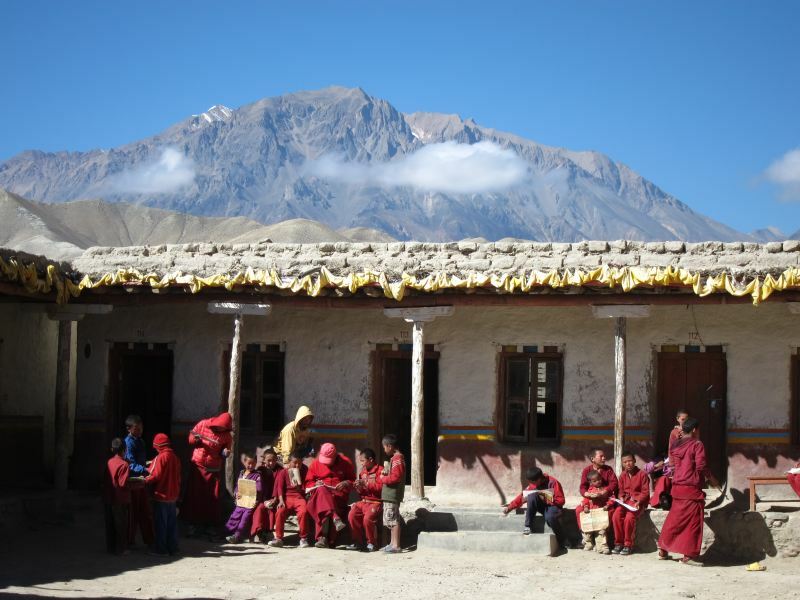 After 50 years of Chinese depredation on the plateau, Mustang is more Tibetan than Tibet proper, which often feels hollowed and Disneyfied and where spies can seem to outnumber monks. 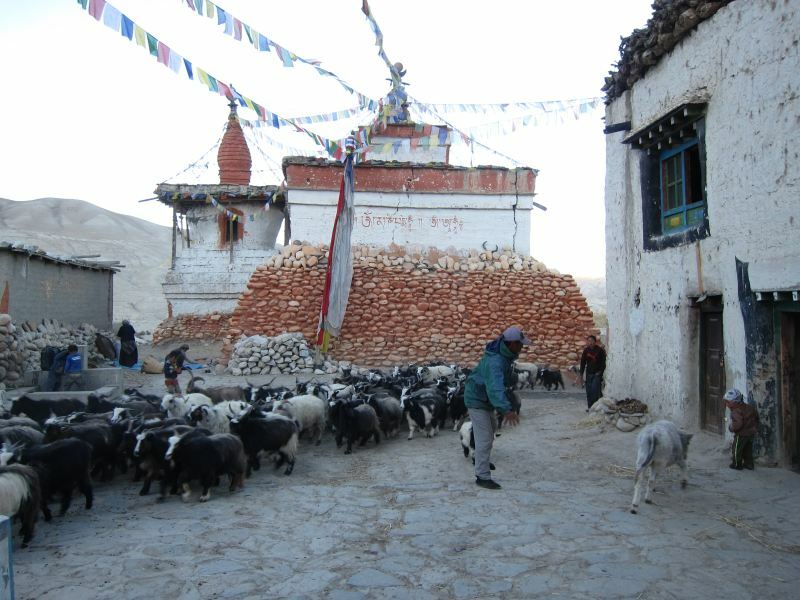 Every path passes prayer flags and chortens: mani walls abound, often metres long, composed of beautifully carved calligraphic stones, the product of centuries of skilled and dedicated work. 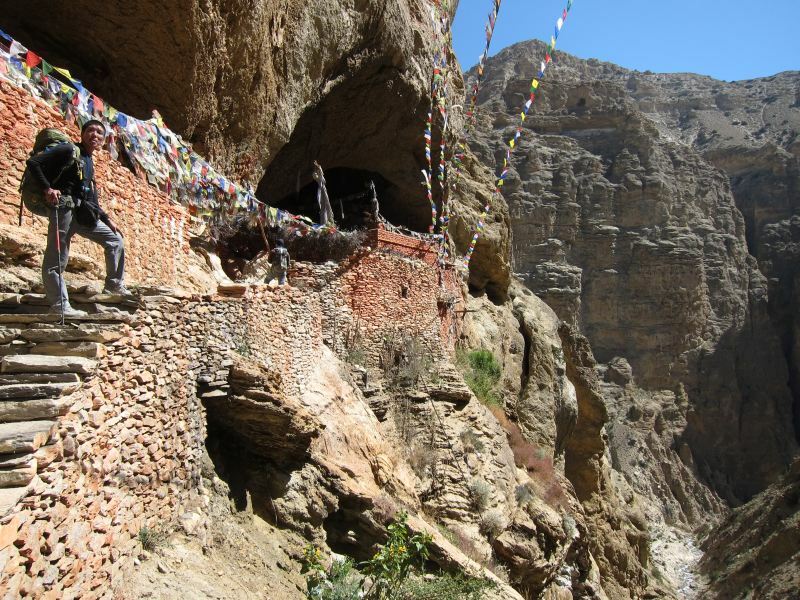 Monasteries and hermitages are to be found in quiet corners: caves, rivers and passes, sometimes it feels like every stone, have sacred connotations. 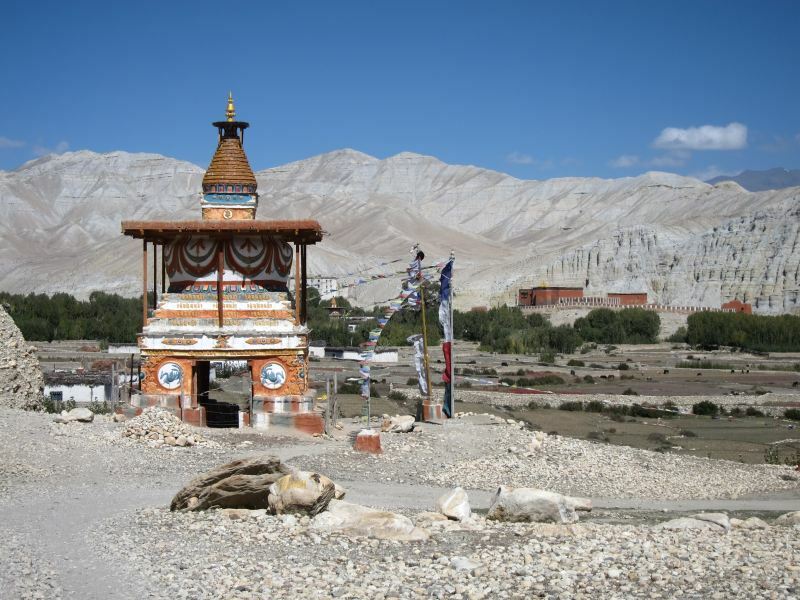 Mustang became Buddhist early on in the conversion of the Tibetan world, with the temple of Lo Gekhar dating back to the 8th century. 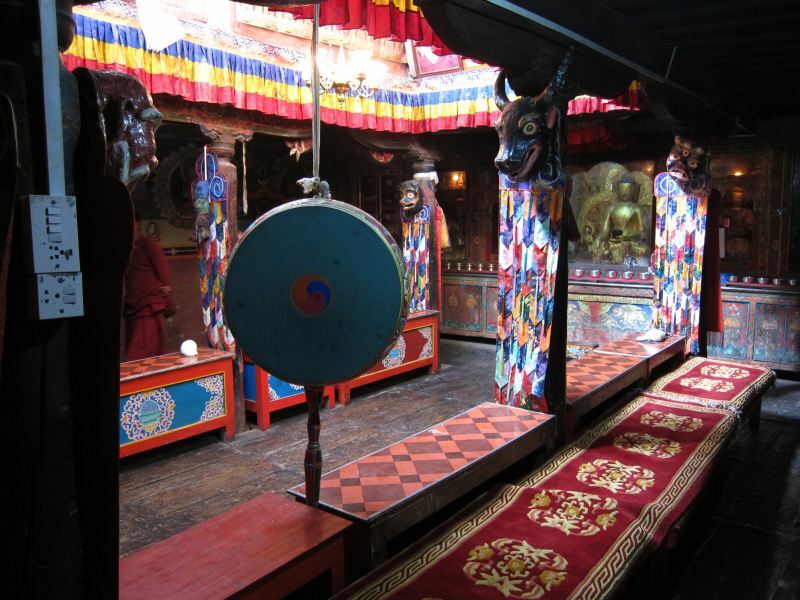 This antiquity, and the area's isolation, are evidenced by most of the monasteries adhering to the older Tibetan Buddhist sects. 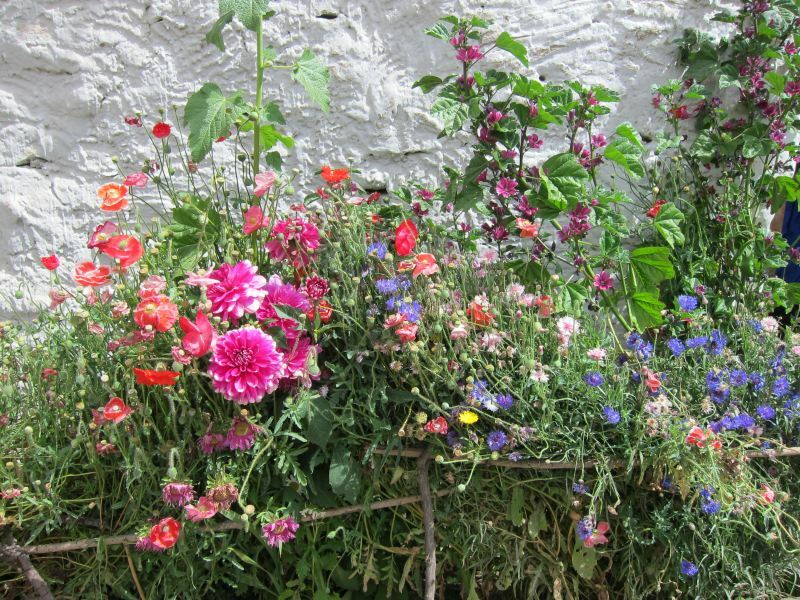 The area's greatest glory is its towns and villages, incredible collections of houses redolent of the European Middle Ages. 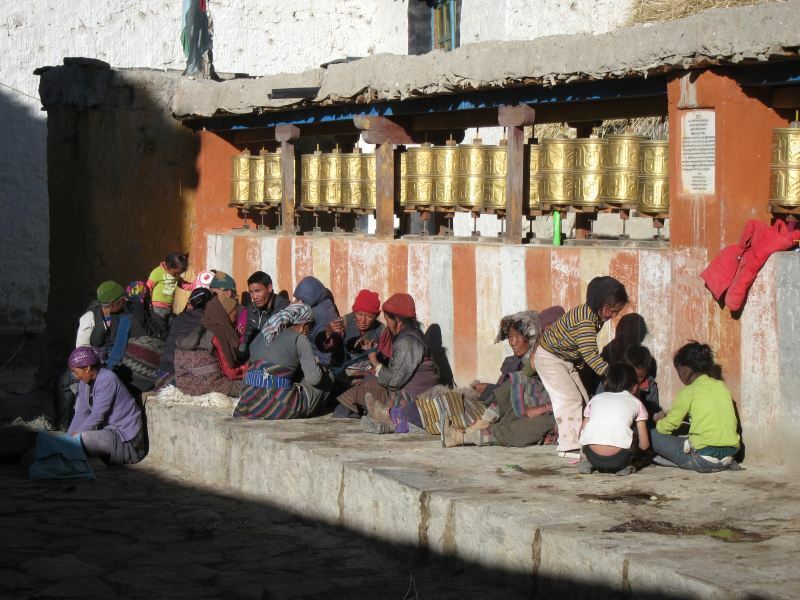 Families live with their animals, the spiritual world is everywhere, with prayer wheels and chortens on every street corner. As is dung, and not mere animal stuff at that. 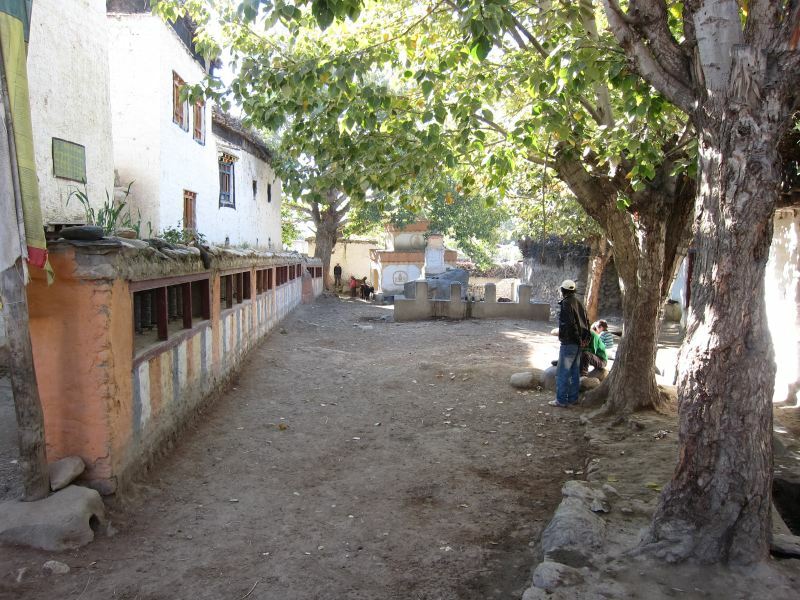 These are, however, prosperous and comfortably founded places compared to their Tibetan counterparts: there was rich trade to live off and more water than in Tibet, so it was possible to settle, terrace up and cultivate the valley bottoms. 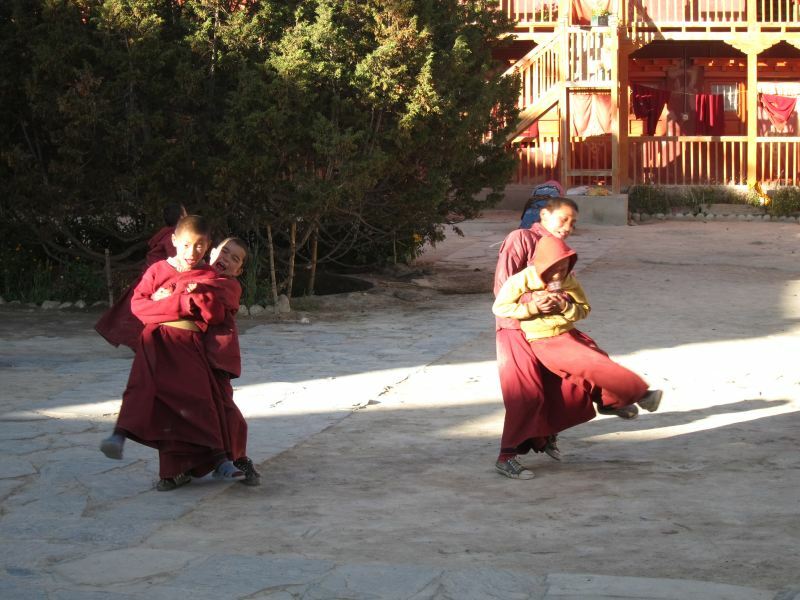 The rigours of the plateau have meant that most Tibetans have always been nomads. 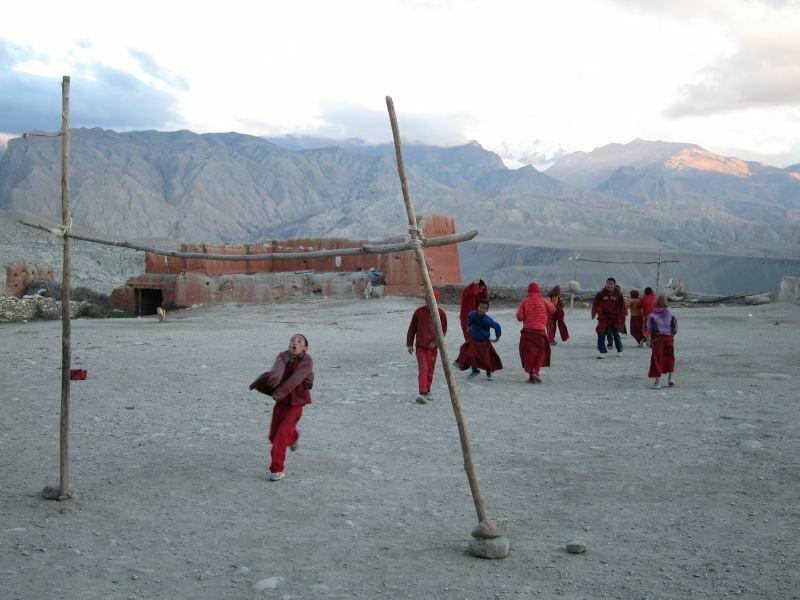 Ghami and Tserang (the old capital) are particularly wonderful towns: choosing a favourite village is invidious, as they are all wonderfully atmospheric in their little oases of terraced fields, but don't miss Drakmar under its famous red cliffs and Chhusang, down in the main gorge, with its caravanserai pens and narrow, winding main street lined with ancient courtyard-houses . 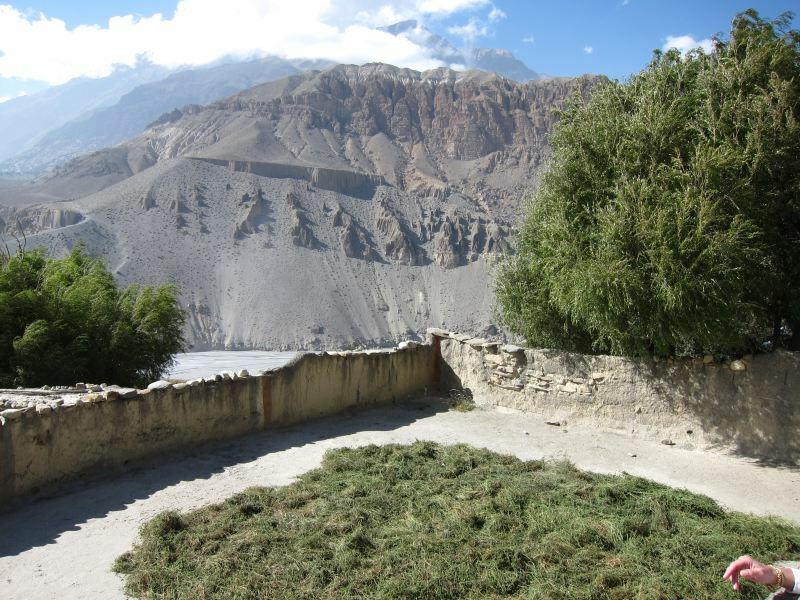 We particularly liked Samar, in a poplar grove and possessing perhaps the best Annapurna views as well as our favourite campsite, on an enclosed terrace by a rushing stream. 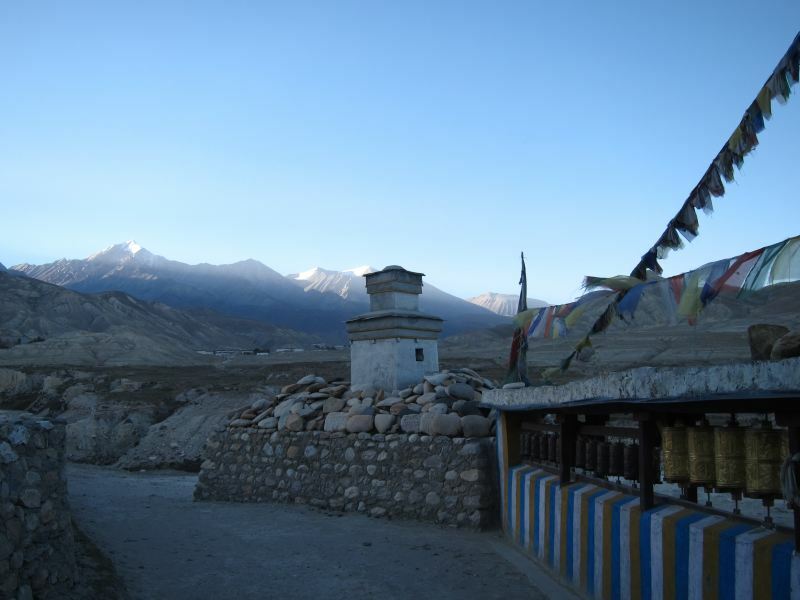 Walled Lo Munthang (pop apparently 1,000, although it feels like more), the capital, lies in the far north, below the range that separates Mustang from Tibet. 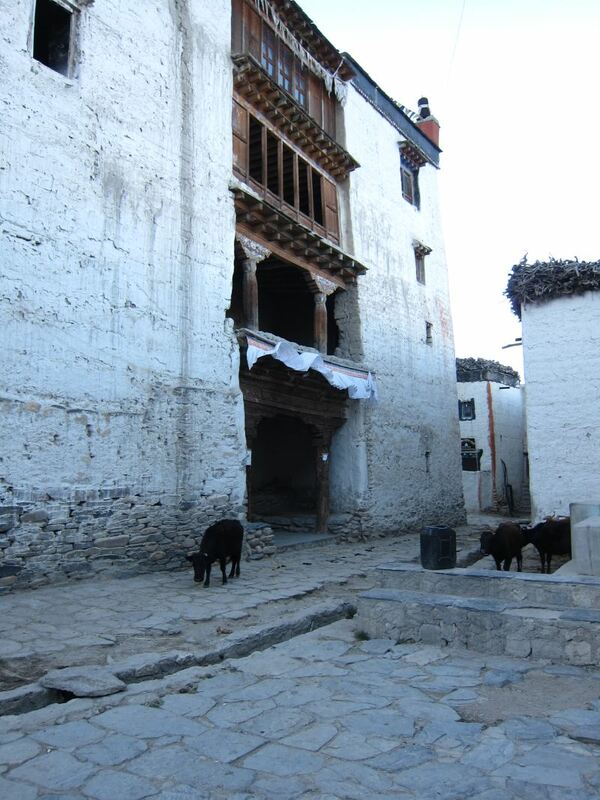 As well as the sturdy palace of the Rajas, direct descendants of the kingdom's 14th century founder, whose rule ended finally in 2008, it contains Mustang's finest collection of monasteries and a maze of fascinating streets. 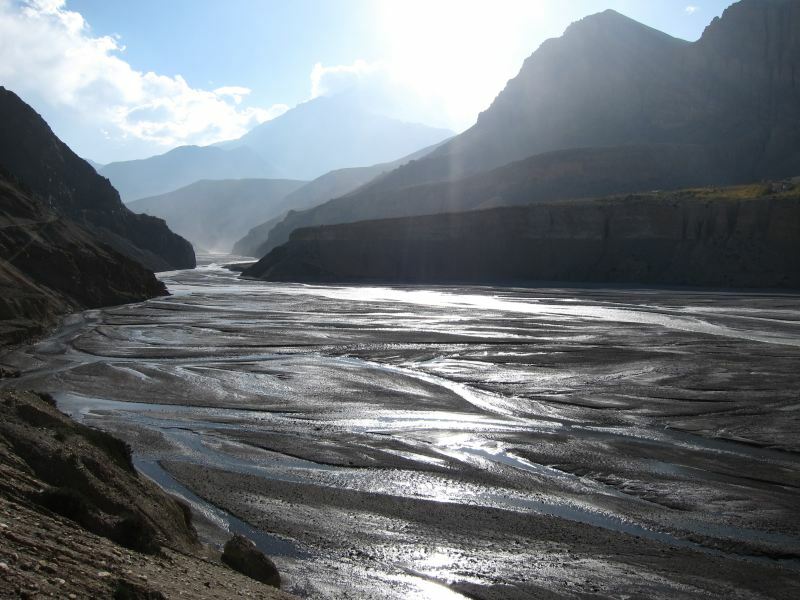 Mustang lay on the main trade route between India and Tibet: salt, wool and spices followed the Kali Gandaki river into its vast gorge between the great Himalayan massifs, one of many aspirants the title of the world's deepest, that linked the high Tibetan plateau with the steamy lowlands. 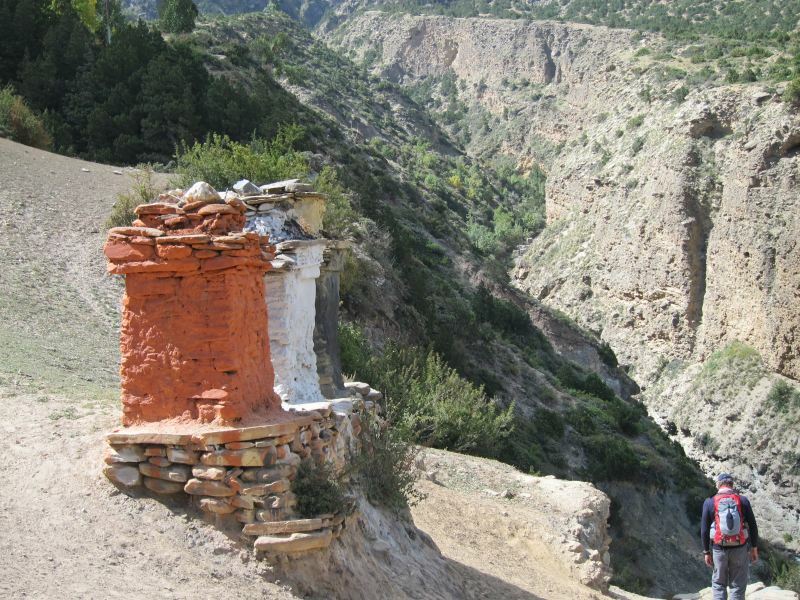 This resulted in a turbulent history, evidenced by the huddled, defensive-looking villages and the ruins of towers that seem to occupy every bluff above Lo Munthang. It was also the source of centuries of rich religious life and relative prosperity. 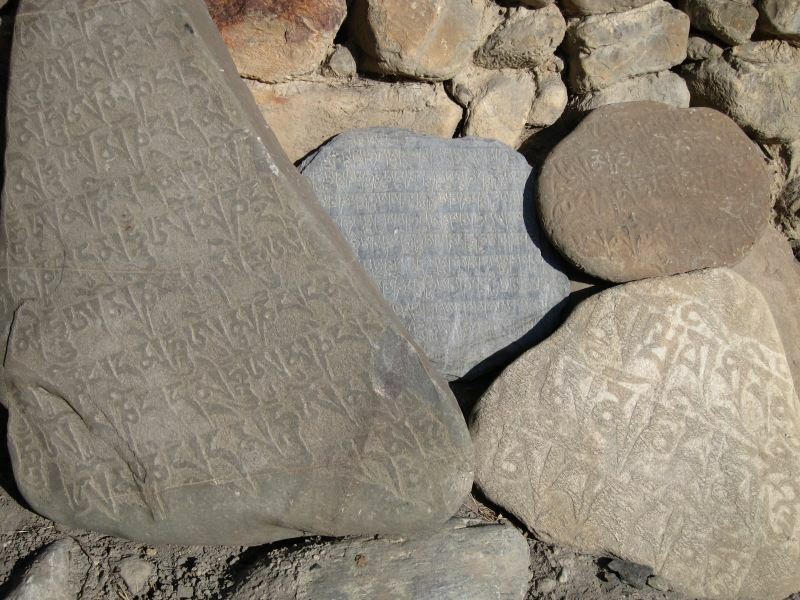 It was part of Tibet until it became a tribute paying part of what was later Nepal in 1790. No doubt China will assert a claim at some point. 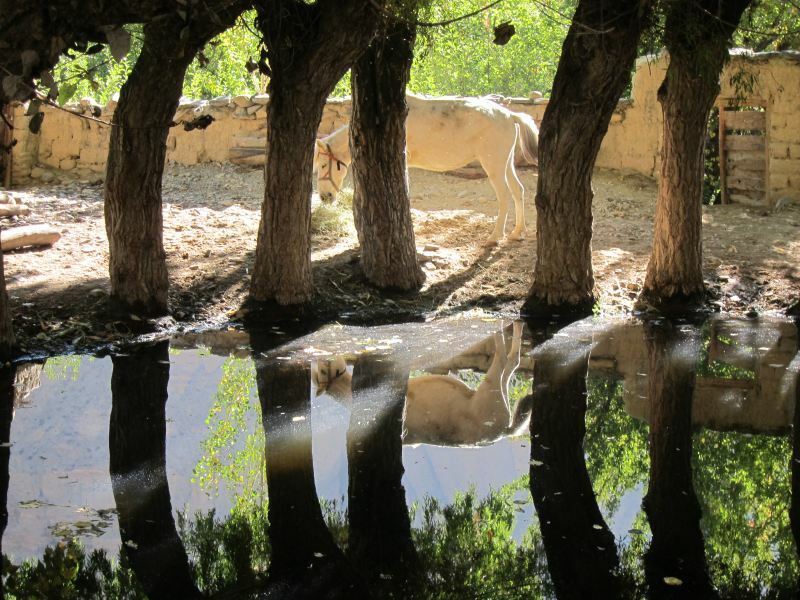 Mustang is astonishingly beautiful in a stark, barren, tree-deprived sort of way. 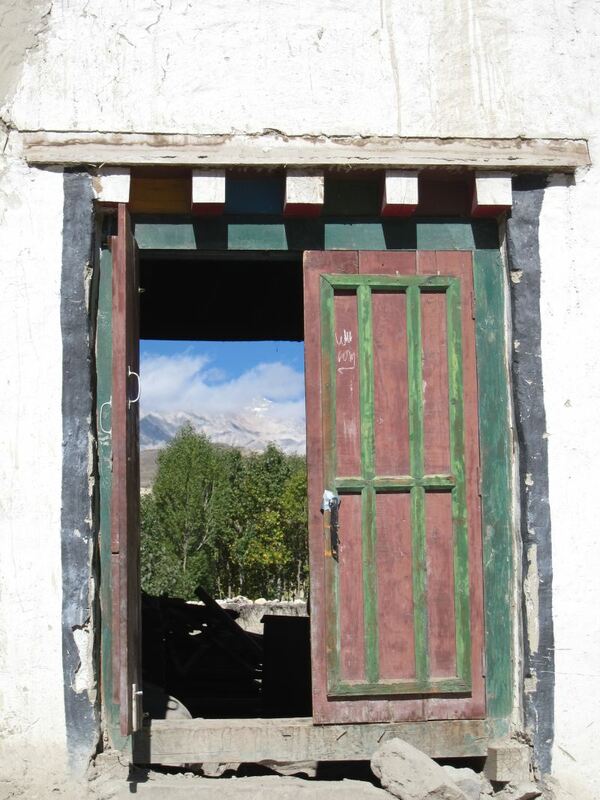 Even geologically, it is Tibetan rather than Himalayan. The primordial Tethys seabed, thrown 4,000 metres skyward by the collision of India and Asia, has eroded into fantastical cliffs and contortions of crumbling sandstone and conglomerate, their vivid colours ranging from reds to ochres to blue-greys. You can still spot exact points, such as just above Mukinath, where eroded sandstone flutings give way to hard, dark, alpine rock. 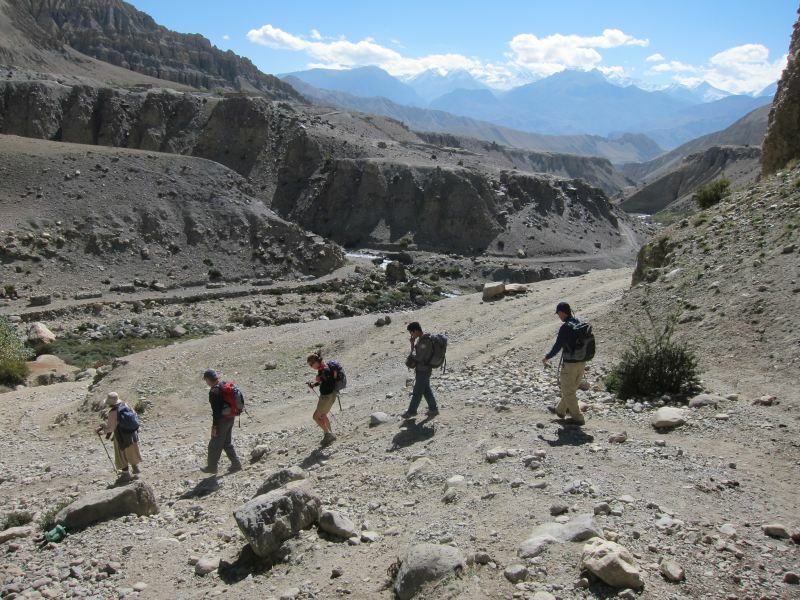 We picked up fossils from 4,000m passes. Wildlife includes the snow leopard, the blue sheep and, supposedly, the yeti. 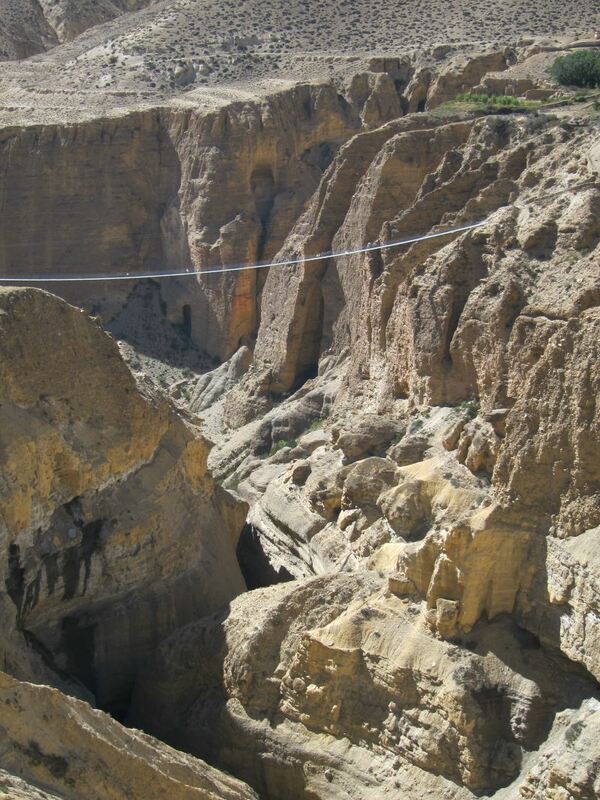 Eagles and vultures, including huge lammergeiers, are to be seen manoevering on the thermals. 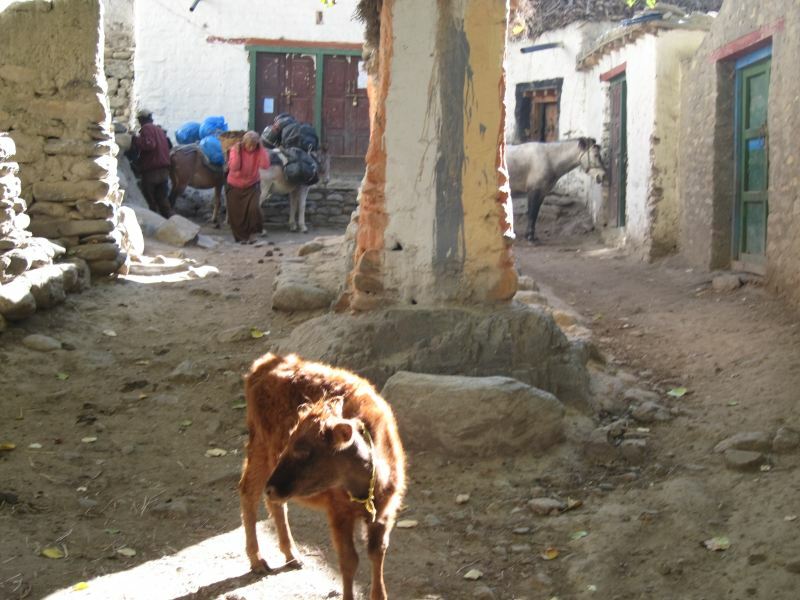 Jackels can be heard prowling around village edges at night. 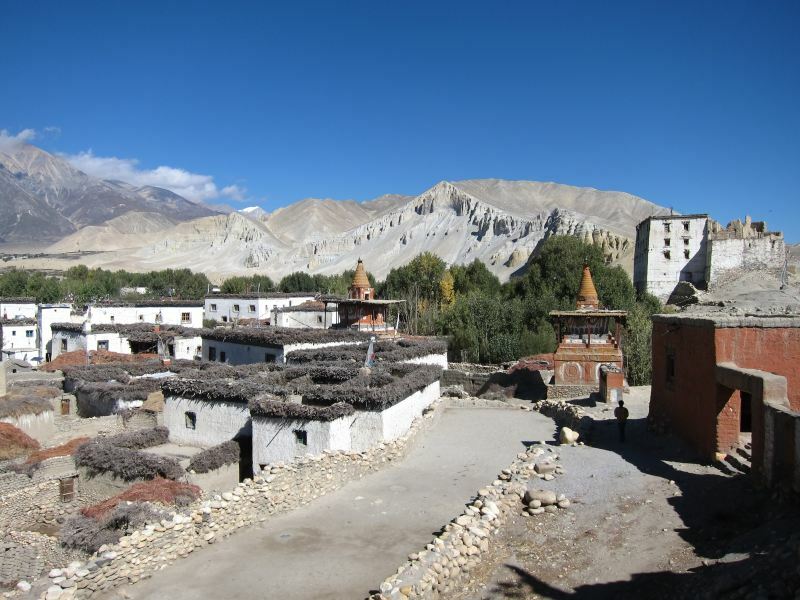 Long closed to visitors (it was a base for Tibetan guerilla resistance to Chinese rule and thus a very remote corner of the cold war), Mustang was opened to visitors in the early 1990s. Even now, only 1,000 permits (although that seemed low when we were there - maybe some extra fall out of the back of the permit office?) 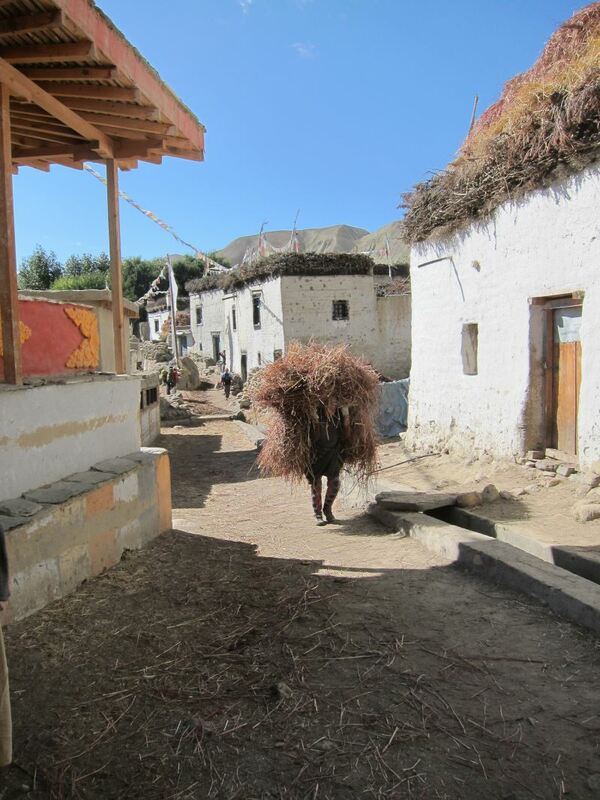 are issued a year, which really must help the area remain culturally pristine. The high cost ($650 for 13 days) and limited number of permits is contentious. 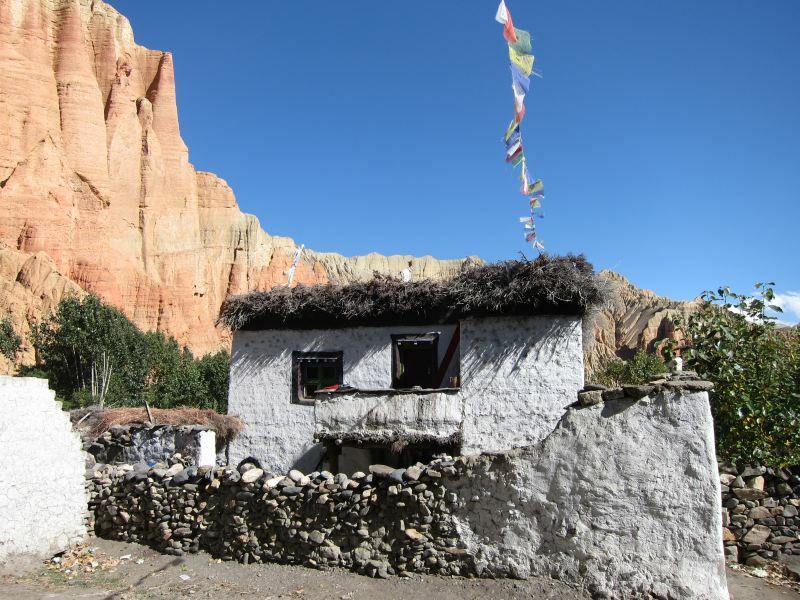 Little of the money actually gets to Mustang, so the benefits can seem illusory, and there is a lobby for more and cheaper permits. Difficult. 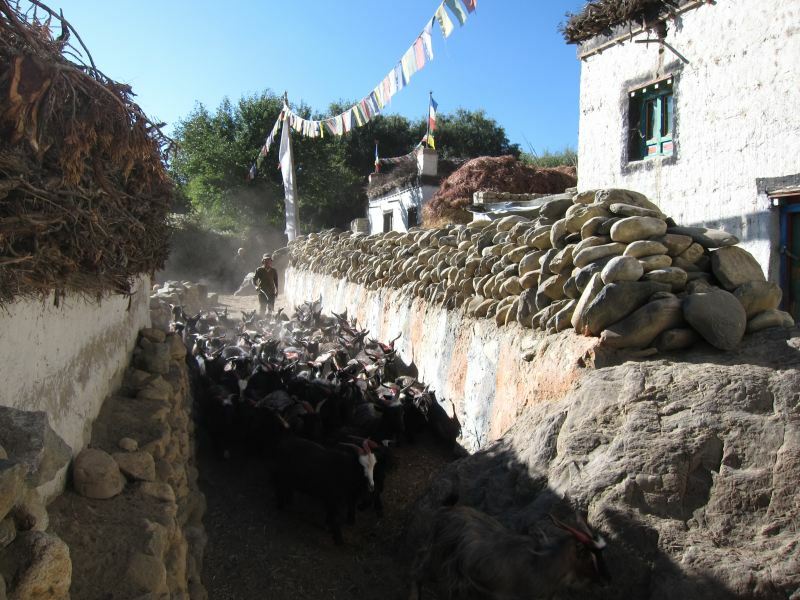 The centuries of cultural slumber are being rudely broken: a road has been cut the whole way to Lo Munthang, and up to the Tibet/China border. 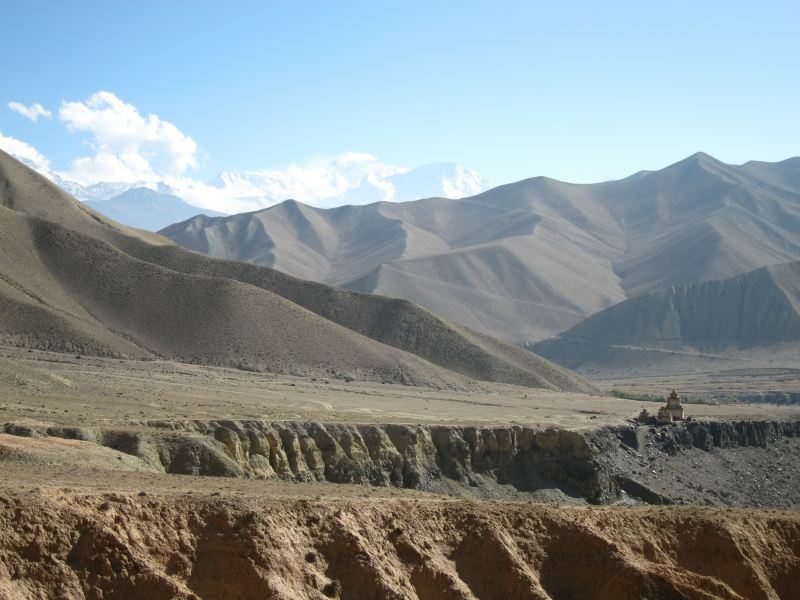 Although (as of 2012) this is a very rough track passable only by the hardiest of jeeps and motorbikes, this must be going to change everything, and is a huge issue for the locals. 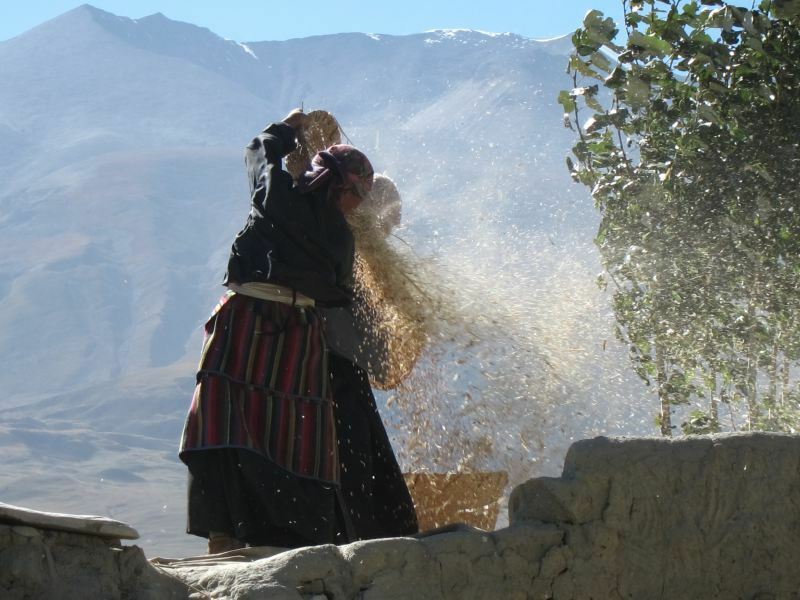 It brings access in medical emergencies but also to cheap grain and goods from Chinese Tibet, which is much nearer to the upper, Lo Munthang, end than is Nepal. 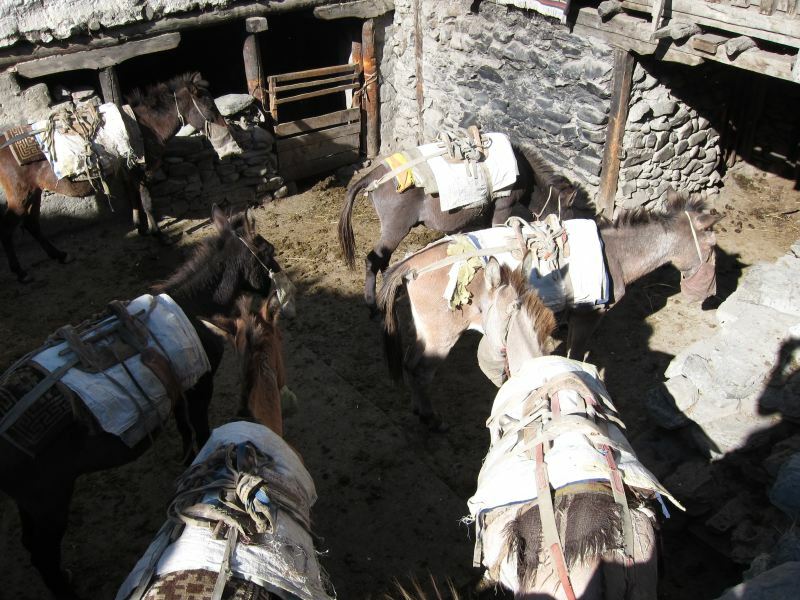 As Tibetans, they fear Chinese power and influence and their deeply felt way of life and religion: jeeps and motorcycles will inevitably replace the horse (well, pony or mule, really), so central to their economy and culture for centuries. 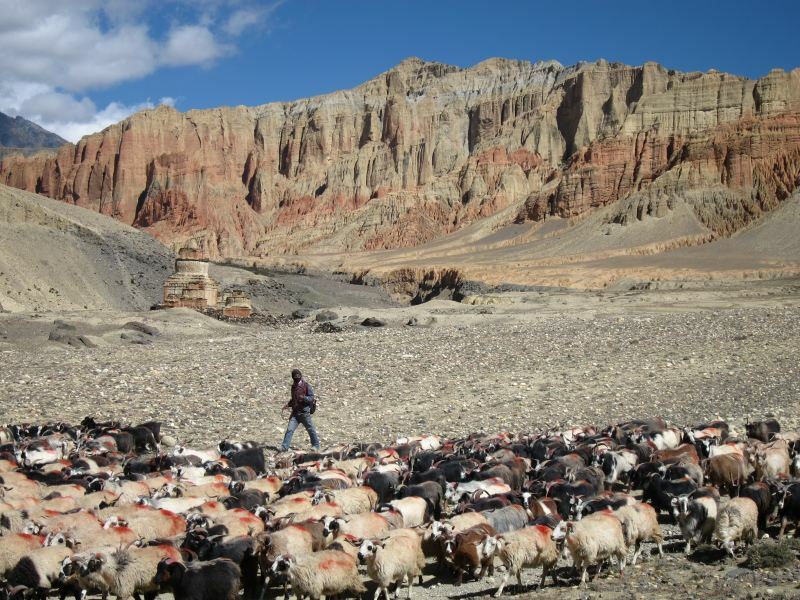 Ironically, tourists may help here, with trekkers' baggage trains and pony safaris still providing demand, as long as it is kept relatively high end. 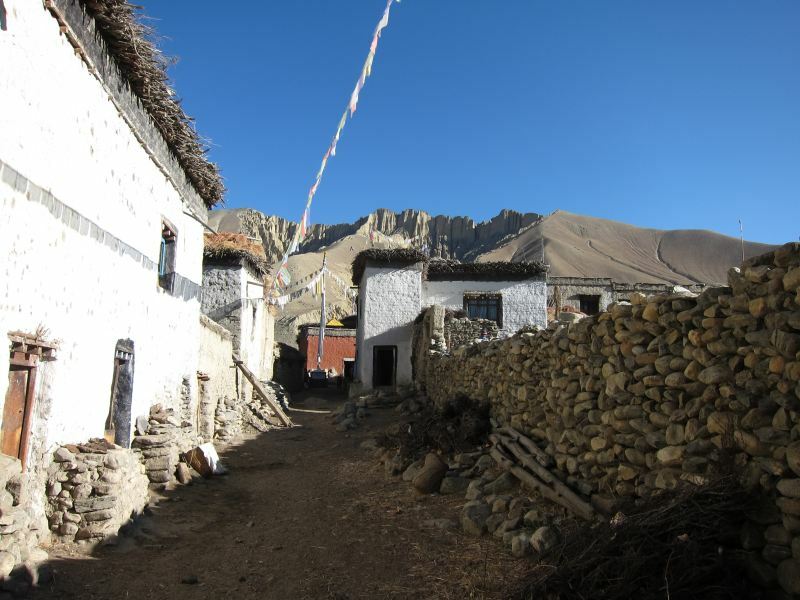 But there, too, is a problem, as camping is only doable near the (rare) rivers and thus on the village outskirts, and they are not always the mellowest places when the dusty afternoon wind is blowing. But swanky hotels would be a disaster. 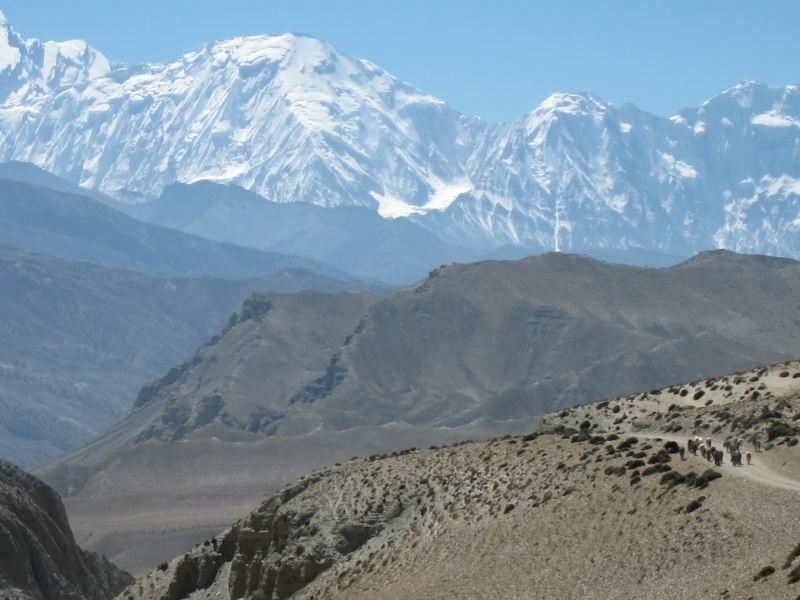 This heady (well, altitudinous, anyway) combination makes for some of the best trekking on earth. 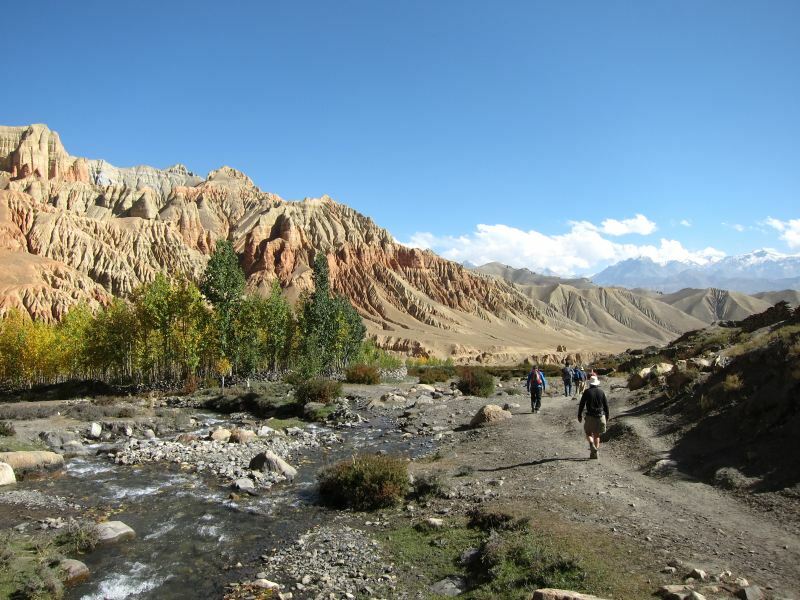 Its dryness means Mustang has a much longer trekking season than most of Nepal, although it is a different experience from classic Himalayan trekking, as a result. 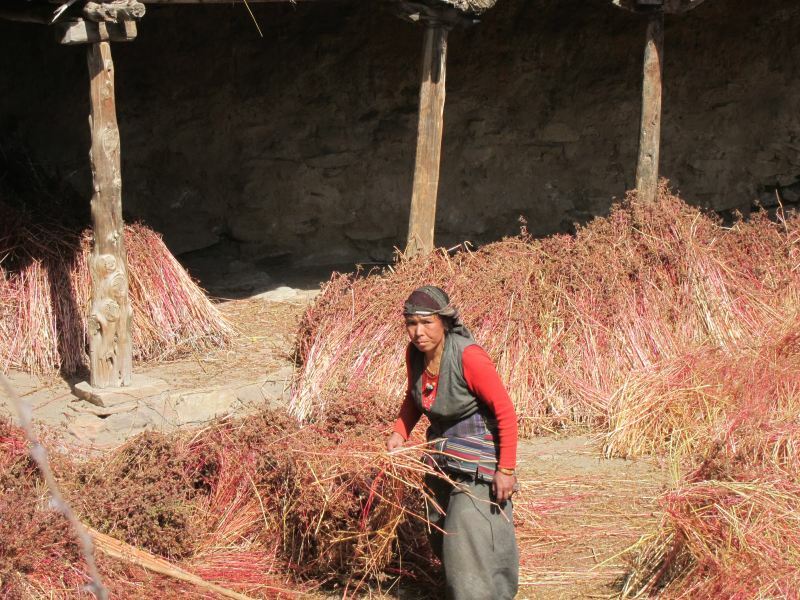 Spring is a good time to come, when flowers soften the barren hillsides, and Summer works well, although Autumn sees most visitors, mainly because this is generic high Nepal trekking season. 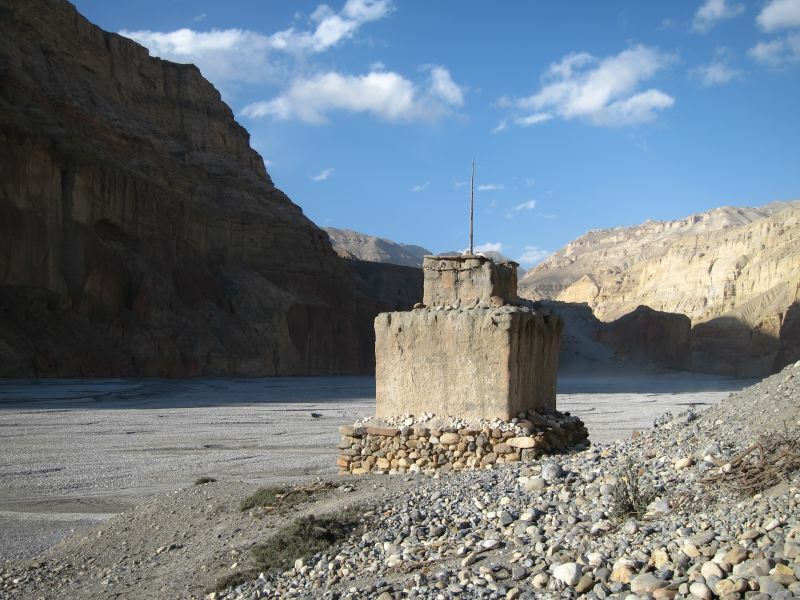 All expeditions enter from Jomson, to which you can fly, walk or even drive, winding up the sides of the huge Kali Gandaki valley into the heart of Mustang, with Lo Munthang as the goal. 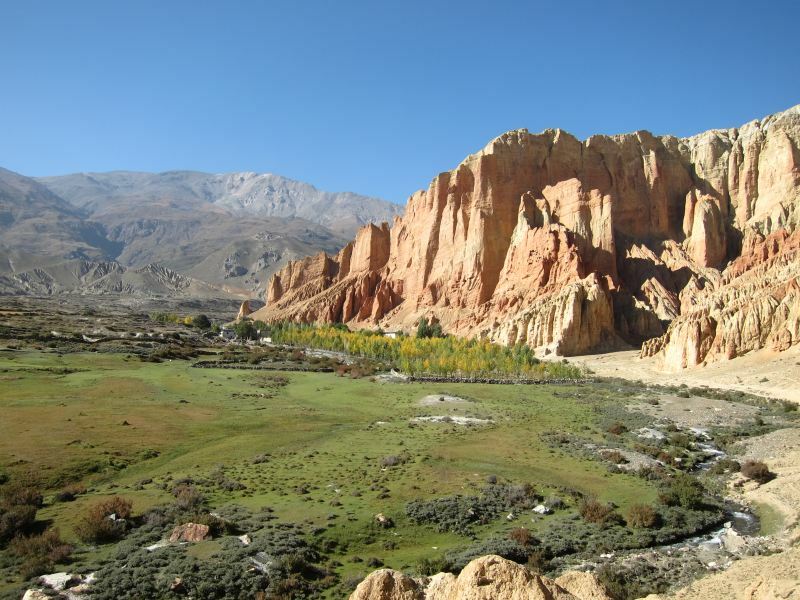 The classic route climbs the western side of the great valley from Jomson to Lo Munthang in four or five days, spends at least two days in the Lo Munthang area, and returns down either side of the gorge to Jomson: the western side has more to see, and you can return using different routes for a significant part of the way, but the eastern side has the wilder (if that is possible) and remoter landscape. 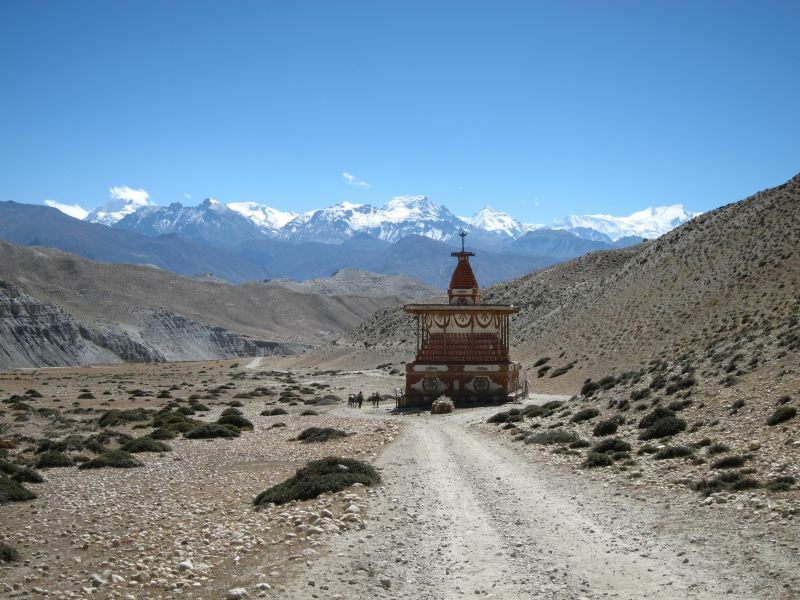 A final detour to Muktinath, gaining outstanding views straight into the high Annapurna massif from the 4,077m Gyu La, is a must and guarantees that you end on a very high note and avoid the law of diminishing returns. 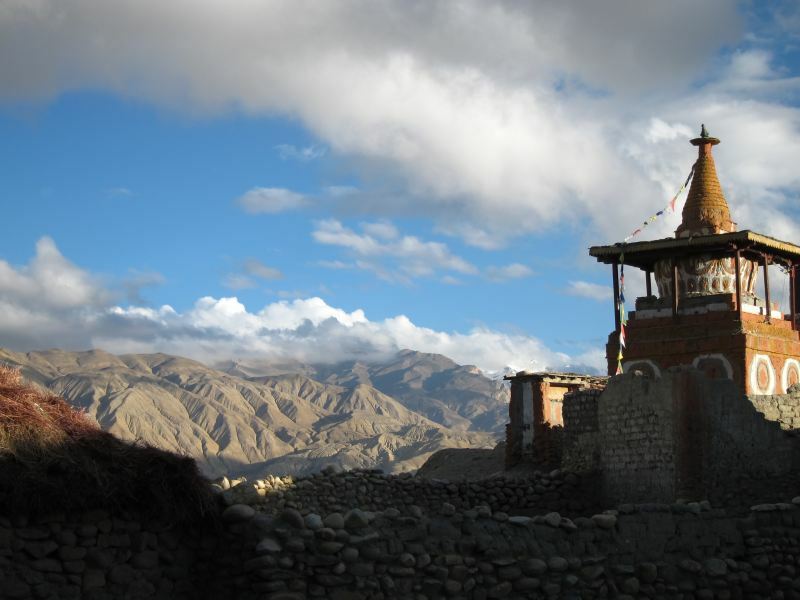 Muktinath is sacred to several religions and a major place of pilgrimage: while it may be hard to raise cultural enthusiasm after a long, tough day's walk, it is worth the effort. 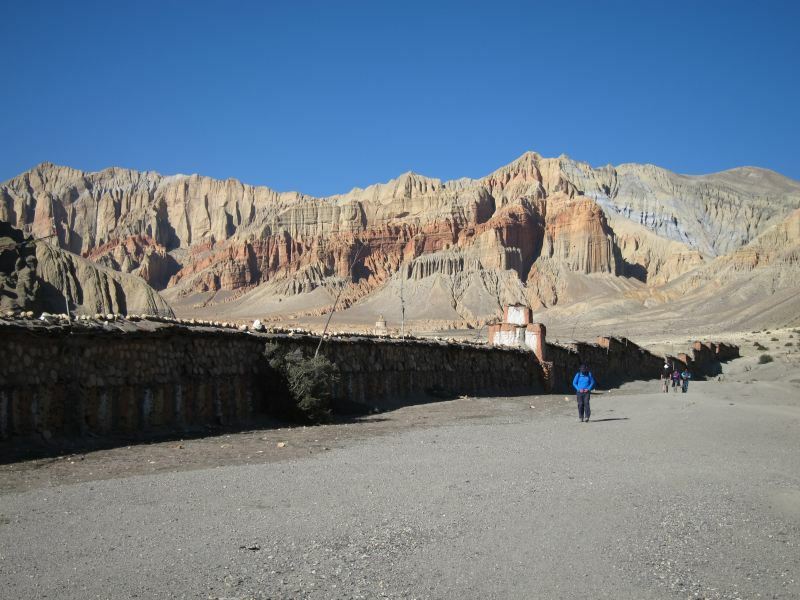 The nearby town is peculiarly disappointing, though: a grim concretery catering for pilgrims and Annapurna Circuiters: after the cultural purity and emptiness of Mustang, it will be a shock. 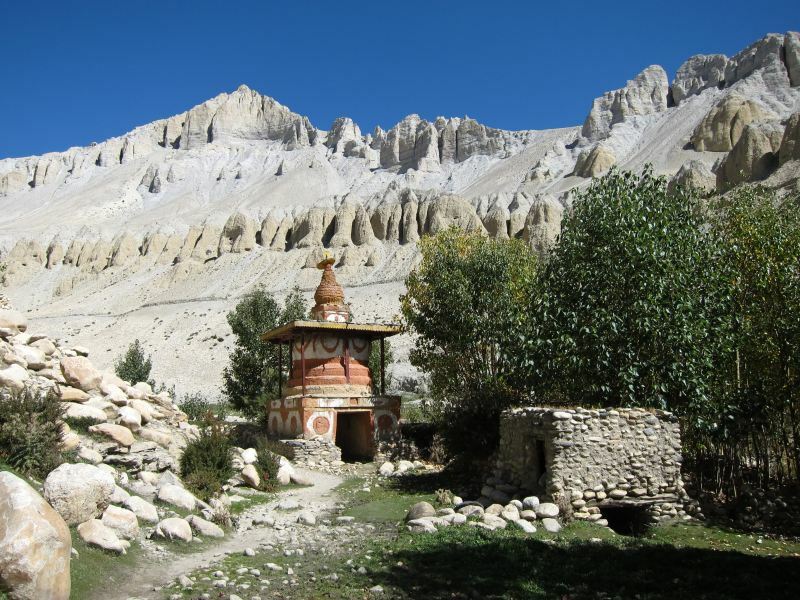 You could sort-of teahouse trek in Mustang, although realistically you can only stay in the at times very basic hostels in the villages, which are scattered as a result of the topography and dryness, and you could easily arrive somewhere and find all berths taken. 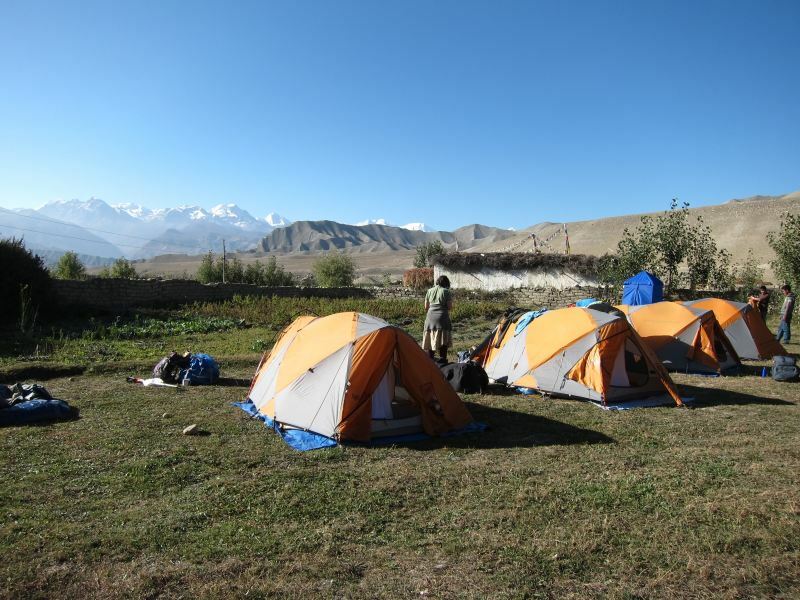 Camping, with full Himalayan-style support, is the best option if affordable, although this isn?t as delightful as the classic Himalayan experience: think a dusty, windblown terrace on the edge of a village, rather than high meadow complete with a stream and an icy peak overhead. That said, you can find some lovely orchards and sheltered corners to park yourself in. It is worth noting that some of the timings in the guidebooks may be a bit optimistic, depending on your age. The days start early here, as a stiff, dusty wind roars up from the south in the afternoon, which can be better spent in shelter of sorts. 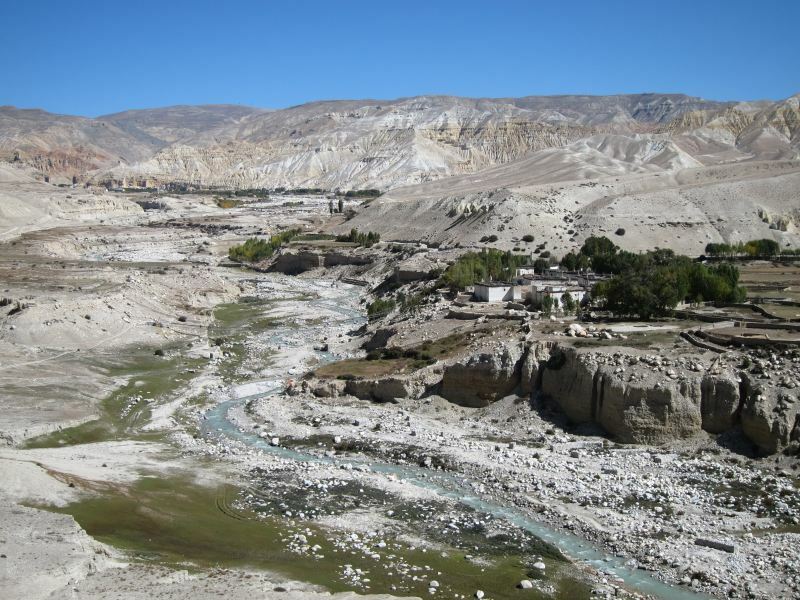 This is particularly unpleasant in the Kali Gandaki gorge between Jomson and Chele, but affects the whole area to a degree. 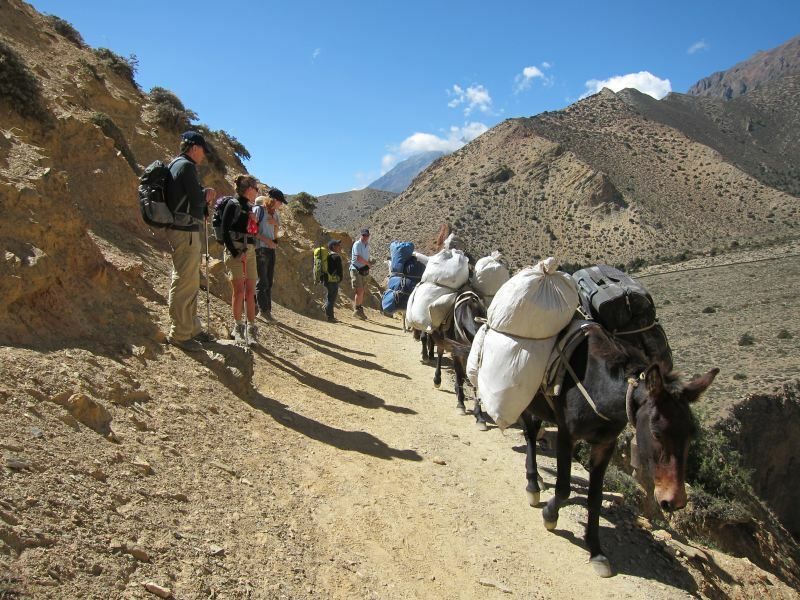 While the trekking isn't on the whole massively difficult, remember that the altitude can cause misery and even death. 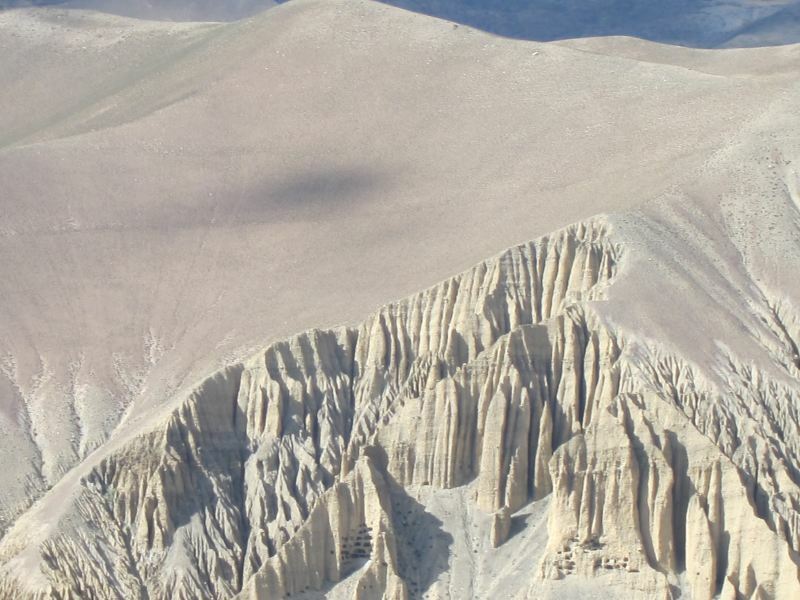 It is likely to affect you to some degree, although altitude is gained gradually here, and most still think that a major Mustang walk is a high point of their hiking lives. 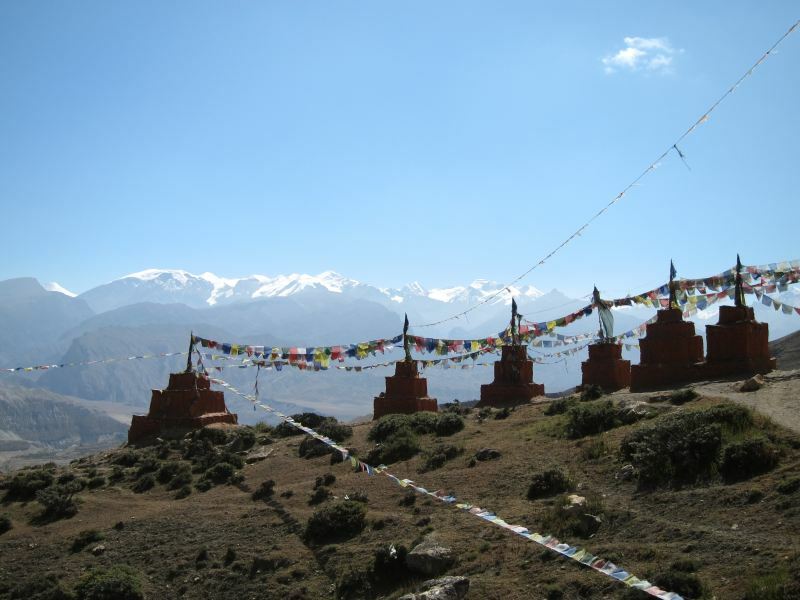 In October 2012, seven middle-aged Brits walked to Lo Munthang and back. Here's how it went.